1989 AMT Ertl. Ne w in Box, Sealed. New in box. Mint sealed unbuilt model kit. I will not open sealed boxes to check contents. ALL IS STILL SEALED UP IN IT'S ORIGINAL OUTER PLASTIC FACTORY WRAPPER. ALL IS HERE = NEVER OPENED UP. MADE IN #1989. ORIGINAL BOX HAS NO SHELF WARE TO IT. Scale 1:25. SEE PHOTOS for this is what you get when you buy this item. It was partially started. No glue was used. This is a new unopened model kit. The box has some slight dents throughout but is intact and still sealed. Box is a bit rough product is sealed inside. 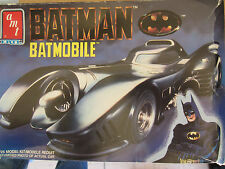 AMT ERTL 1/25 Batman Batwing. -Model Kit #6970. 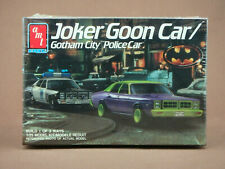 -Includes Wayne Corp Decals. -Released in 1990. New in open box. To all U.S. Zip codes. If factory sealed, the item must remain sealed. TITILLATING TREASURES PRESENTS. This model is in mint condition and still has plastic on it. 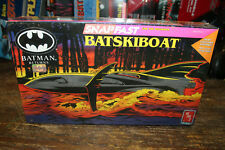 BATMAN BATSKIBOAT MODEL KIT bY ERTL. SKILL LEVEL 2, PAINT AND GLUE ARE NOT INCLUDED. FREE Trial ! NEW AND FACTORY SEALED. Sealed, new and unopened from manufacture. 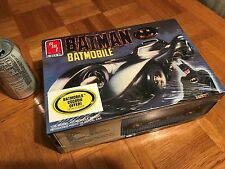 BATMAN 1989 Movie BATMOBILE Model Kit & Blueprinter ARMORED SHIELD COCOON. Both are new in unsealed boxes. AMT / ERTL, 1989. before they are listed. I will not open. UNSEALED or OPENED boxes are. Contents of all. 10 to 25 years old and sold as. broken parts in sealed boxes or for. You be the judge. In sealed box. If you desire any other conveyance you may request it. AMT/Ertl 1995 Dodge Viper RT/10 Model Kit. 1/25 Scale. Old inventory. All complete in perfect condition.